William Morrow Cookbooks, 9780061998249, 320pp. 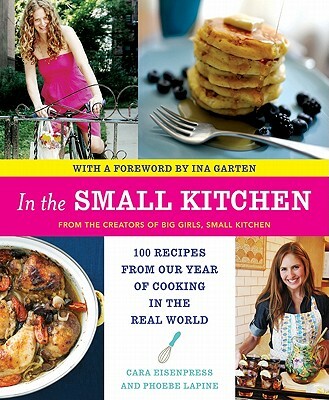 Cara Eisenpress and Phoebe Lapine, creators of the popular food blog biggirlssmallkitchen.com, share their kitchen prowess and tasty tips with In the Small Kitchen: 100 Recipes from Our Year of Cooking in the Real World. Filled with delicious and resourceful recipes for daily cooking and entertaining on a budget, In the Small Kitchen is required reading for anyone who wants to put an appetizing meal on the table. More than just a guide to quarter-life cooking, this cookbook is also a wonderful ode to the people we cook and eat with, who stick with us through breakups, birthdays, and myriad kitchen disasters. Cara Eisenpress and Phoebe Lapine met in seventh grade at the Fieldston School in the Bronx, where they bonded over oatmeal chocolate chip cookies. They have been cooking together ever since. In 2008, they founded the website Big Girls, Small Kitchen.